Yes, I know, a site of wise father style investment and Piotroski method, which speaks of Forex, it seems absurd. In fact, the idea is to be open to interesting researches and see if we can get something for our value investments. What the forex trades by schedule tells us ? 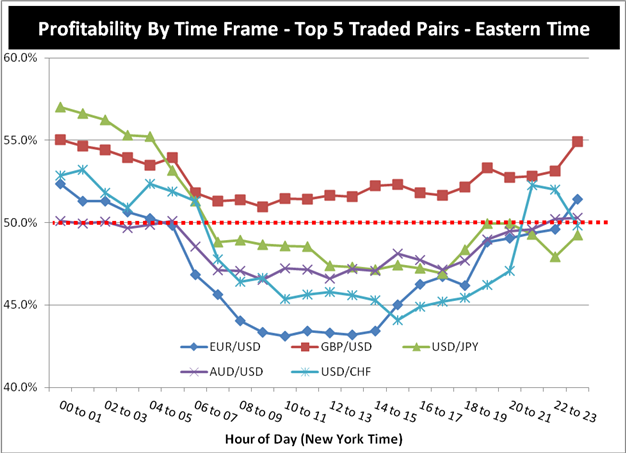 For the major pairs like EURUSD (Euro exchange rate in USD), the best time to trade and make money, is during european night hours, i.e « Asian time ». We note from the graph that the GBP USD (The study is expected to have been made on real accounts at the broker FXCM) works best. However, for these two conclusions, the reason is that at night or on the GBP-USD, this is where the movements are more predictable because the volatility is reduced. The rest of their article shows that it is very important to trade at the right time because in fact anybody that does not take this info into account and trades « as the average guy » and anytime, would reduce its capital regularly. Of course, this forex strategy to focus on « Asian times », does not work for Asian currencies, which are volatile at these times. If you want to take advantage of this knowledge, you can use a trading robot to help you benefit of these trends. What can we deduce for our value investments? Well, I would say the opposite: since we have long trades, and we are not on short ranges, we must take advantage of volatility to buy or sell! So watch the volatility indicators. If it explodes, it means the market has overreacted. We still have to study the correlation between the VIX (volatility indicator) and the market turns to see the precise levels to monitor.